If you are a veteran and are interested in joining HLAA please complete Veteran Membership form and mail it, fax it or email it in. Free HLAA Convention Registration- come see us in St. Louis in 2015! 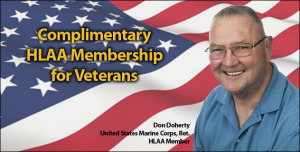 HLAA would like to show its support of veterans attending by offering a convention registration at no charge. For more information about registering for HLAA’s annual convention, contact the Director of Events and Marketing.